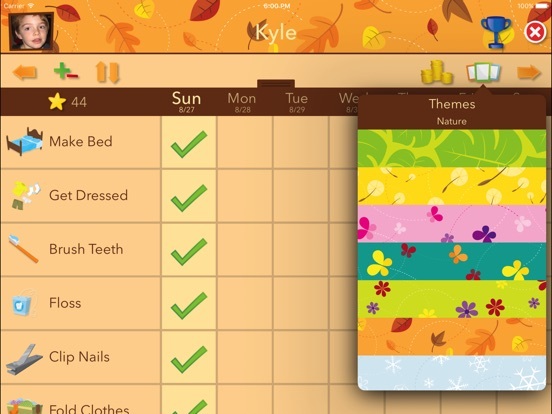 Chore Pad is a calendar based reward chart to reward children for completing tasks. The child sees a weekly chart of their tasks and can tick them off when completed. The child earns stars for tasks which they can cash in later for rewards. 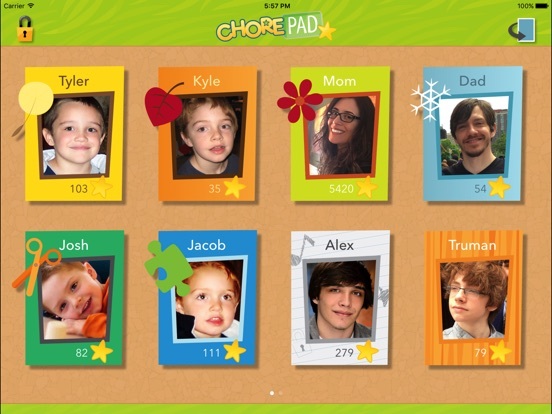 Chore Pad can be used by multiple children. Chores can be completely customised. 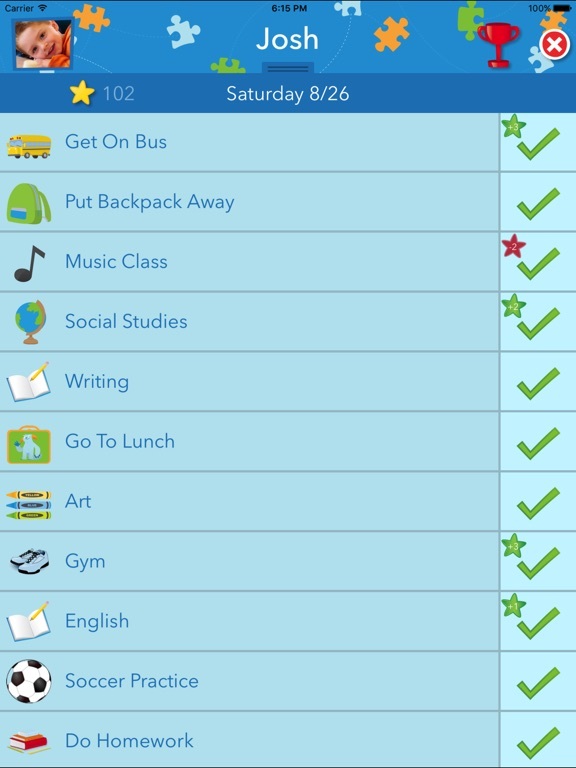 You can add in chores icons from a list, the days in the week they need to complete the chore and the number of stars they earn. You can also customise the theme of the app. 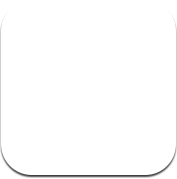 Number of tasks: This app allows you to add as many chores or tasks as you want. 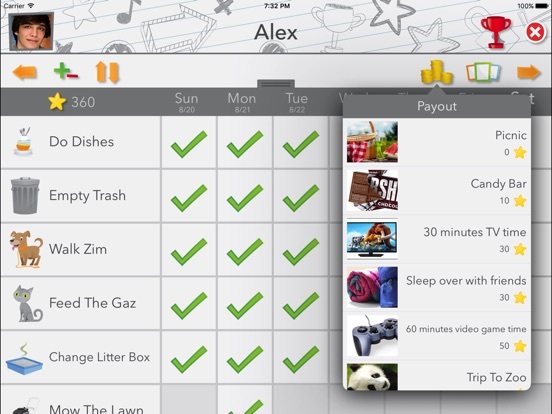 Picture of chore or task: You can add your own images for chores. Tokens awarded per task: You can award between 1 and 10 stars to each chore. Rewards: You can create your own text based reward and add images for rewards. Password Protection: Importantly, you can lock the editing function of Chore Pad so that students can't tamper with the reward system. (*) This app has been ranked according to its' effectiveness to achieve the learning goals and strategies listed. Some apps may rank highly for achieving a specific use and lower for other uses. Some students will learn and engage with one app more than others, because of the individual nature of us all. Learning apps are designed for a specific purpose. The authors claim to teach a goal, skill or concept. Bloom's Taxonomy is classification system used to explain the behaviours important in learning. Apps range from simple memory tasks such as flashcards apps through to creative apps which ask students to create an original story or video. The student creates new ideas, products or ways of viewing things. Activities include making, animating, designing, constructing, planning, producing and inventing. The student justifies a decision or course of action. Activities include counting to check, hypothesising, critiquing, experimenting and judging. The student breaks the information into parts to explore understandings and relationships. Activities include explaining, ordering, inferring, comparing and organising. The student uses the information in a new situation. Activities include implementing, carrying out, using, illustrating, classifying and categorising. The student comprehends the new information. Activities include describing, predicting showing understanding use a multiple choice. The student recalls information they know. Activities include matching, 'fill in the blank', making a choice, answering using a multiple choice, naming a group. How well does the app teach the targeted skill or concept? This is the area where we refer to current research and pedagogy to evaluate the efficacy of the app. Authenticity looks at the manner in which skills are learnt. Authentic apps use real life or genuine activities. Students learn in context rather than in a contrived or rote fashion (such as flashcards). Feedback needs to be specific and result in improved performance. Feedback should be supportive and encouraging rather than negative. Data should be available to support decision making. Differentiation is the ability to customise the app to suit the student. The ability to record you voice, customise text, add pictures and alter settings enables individualisation of the app. User friendliness is a measure of how well a student can use the app independently. Some apps are simply intuitive to use. Others include audio or visual prompts which support the student. All apps are engaging the first time they are played. However, students with diverse learning needs may need to return to the app many times. Motivating apps offer rewards,games or incentives. Reward systems encourage positive behaviours. They can be used to reward social skills, organisation and completion of tasks. An example is a token economy where children earn tokens, stickers or stars for positive behaviours. These tokens are later exchanged for rewards. Also see Calendar apps. Reward charts are an established behavioural strategy. This app replaces the star chart on the fridge. Parents have been using star charts for toileting and chores for many years. It would be nice to be able to assign chores more than once a day e.g. for washing hands after meals. The child can self-monitor their progress by adding a star to the chart. The child ticks the task on completion. They receive a number of stars, depending on the difficulty of the task. They also receive rewards once they accumulate enough stars. You can choose activity icons from the premade list. It would be great if you could add your own pictures to the activities. This is a must for non readers. Recording voice on to this app would be a great feature too. The child simply touches their photo to show their chore schedule. The child will need time to learn to set up the chore pad. The help section is extensive. Many parents report that their child is motivated by using this chart. They enjoy earning their stars and trying to get their trophies. Disclaimer: The evaluations and rankings information provided here are based solely on the opinion of the author and are for informational purposes only. Families should seek professional advice before making decisions regarding interventions for their child.